One more cold-weather cheese from the Cheese and Champagne archives to keep you warm … check back next week for a fresh look and fresh posts! 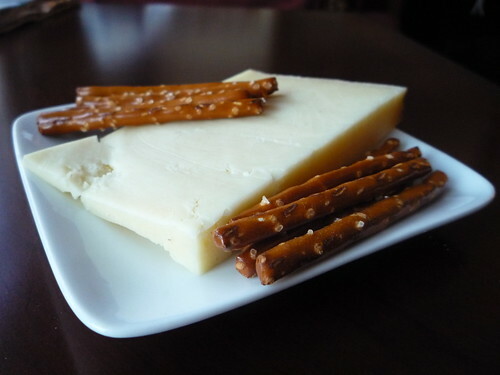 Though you may frequently hear Lincolnshire Poacher described as a Cheddar, it’s not a true version of America’s favorite cheese. 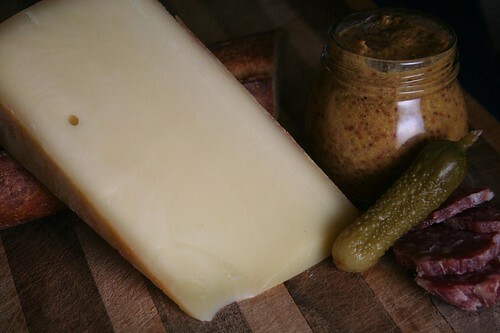 The recipe is loosely based on Cheddar, but the Jones boys say their modifications give their cheese a taste that’s a cross between Cheddar and Comté, and I’d say that’s pretty accurate. Perhaps I’m biased based on my recent experience with Hook’s 15-Year Cheddar, but this cheese had a lighter, more subtle taste and lack of crystals, so my taste buds didn’t scream “Cheddar!” upon sampling. But could you use it in a recipe calling for Cheddar or slide it into Cheddar’s space on your cheeseboard? Absolutely. One of the good things about a lighter-tasting cheese like Lincolnshire Poacher is that it is relatively easy to pair with drinks. Beer, of course, would be a no-brainer, and I could see it enjoyed with both red and white wines as long as they’re full-bodied. A sweet, fruity accompaniment greatly enhances the cheese’s flavor – I nibbled on some dried mango with my Lincolnshire Poacher last night and loved how the sugar content of the mango brought out the cheese’s underlying sweetness. And if my words don’t convince you to try this cheese, maybe you’ll listen to one of our cheese-blogging colleagues, Kirstin, at It’s Not You, It’s Brie, who also recently posted about Lincolnshire Poacher. 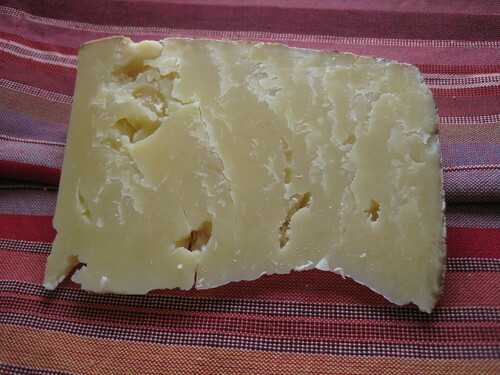 We continue our winter hibernation, but bring you this cold-weather cheese from Switzerland today. Enjoy! 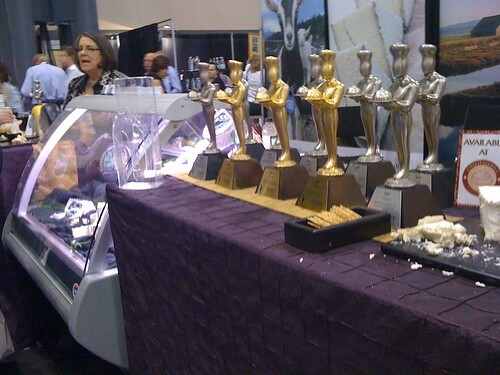 Maybe it has something to do with temperatures that can’t seem to climb above freezing around here, but I’m still craving hearty mountain cheeses. Appenzeller, another Swiss classic from Rolf Beeler, is a semi-firm cow’s milk cheese brined in a centuries-old secret blend of herbs, wine and liquor. 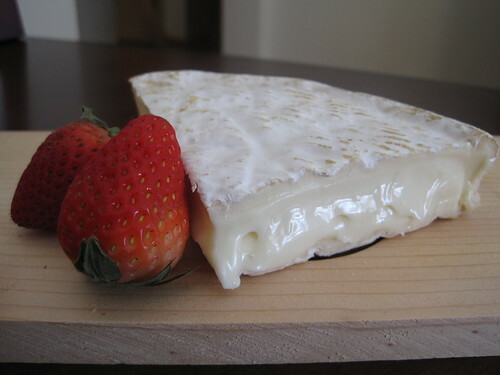 Remarkably smooth, ideally suited for melting (think fondue), the Appenzeller has a sweet, fruity flavor and supple bite, with a spicy aftertaste. 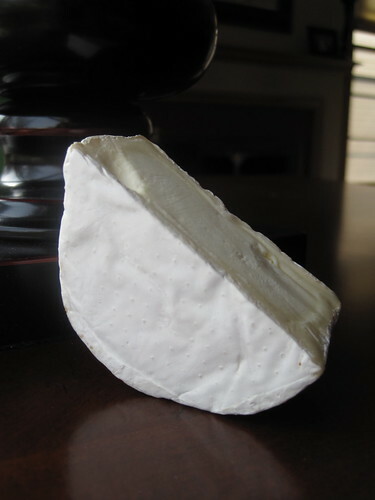 The buttery cheese has a few characteristic large holes and a hard reddish-orange rind. 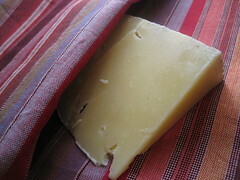 Appenzeller is ideal for cooking, or serve on a cheeseboard with sausages and bread. 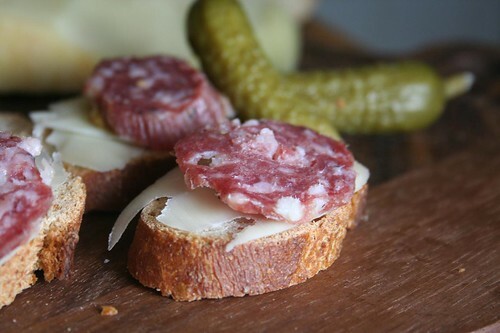 I layered thinly sliced Appenzeller with stone ground mustard and Pinot Grigio salami on a wheat baguette, served with cornichons on the side. Perfect for a slightly gourmet, yet still hearty, Super Bowl appetizer. Enjoy with beer of course (a German bock would be nice), or pinot gris. Check out this travelogue from Appenzell for a look at the cows responsible for this wonderful cheese.